Those of you who have gone on our Japan Lean Tour have no doubt done a little bit of shopping at Uniqlo. An innovative retail brand providing quality wardrobe staples. 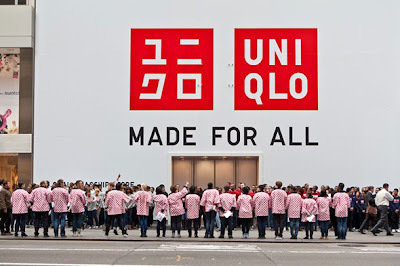 Currently, Uniqlo is the fourth largest clothing retailer, the current top three being Zara, H&M and Gap. “I want to be number one in the world...to be bigger than the Gap.” apparent from this quote- Tadashi Yanai, CEO of Uniqlo's parent company Fast Retailing dreams big. It is this ambition to go for what may seem impossible that took his father's small suit shop to places no one else has dared to dream. But that's not enough to satisfy Yannai. His goal is for Fast Retailing to quadruple current sales to 50 billion by 2020! According to Yannai an appetite for the impossible and the courage to take risks is the secret to success. "You have to be a little eccentric to be very successful. Whether it's Steve Jobs or Andy Grove, they're crazy." Uniqlo has opened 300 stores outside of Japan and the plan is to open 1,000 in China alone by 2020. In Canada Uniqlo products are already available in Toronto with rumours that Uniqlo will soon appear on the West coast. Yannai calls himself a risk-taker, "business is all about risk-taking. The greater the risk, the greater the possibility for profit". However, Yannai by no means condones blindly going all in. He coaches his employees to take risks but to think deeply before jumping. Yannai put this into practice when Fast Retailing made a bid for Barney's but conceded when the price was too high. Let's dream big and challenge ourselves. It is amazing what we can achieve.